For the cosworth range of vehicles in addition to various uprated clutches we offer different transmission upgrades, recommended for power levels between 400 and 600bhp. Big tooth MT75 with either straight cut or helical cut gears for quieter noise. Available in syncho or Dog engagement format. We use revised ratios with 2.95:1 1st gear so that the box has closer ratio’s, far more suitable for modified engines especially when using shorter final drives such as 4.4. Big tooth Borg Warner T5 using Quaife gearset in helical format for quiet operation. Available in std ratios and close ratio with longer 1st gear. All other fitment remains as per standard gearbox. Both 7 and 7.5 inch uprated units available with either Quiafe ATB or plated LSD options. For those with lower power outputs, the std viscous diff can be rebuilt with uprated visous coupling and stronger planet gears. Ratio’s include 3.6, 3.9 and 4.4 as standard options. 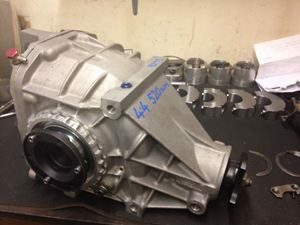 We can also install a Ford motorsport 9 inch rear diff for both 2wd and 4x4 cars with the correct beam and driveshafts, and also offer thick wall front diffs in 6.5 inch and 7 inch units.